This analog dial packs DSP! The Degen DE321 is the first of a new type of radio hitting the market–a DSP-based receiver with an analog tuning dial. 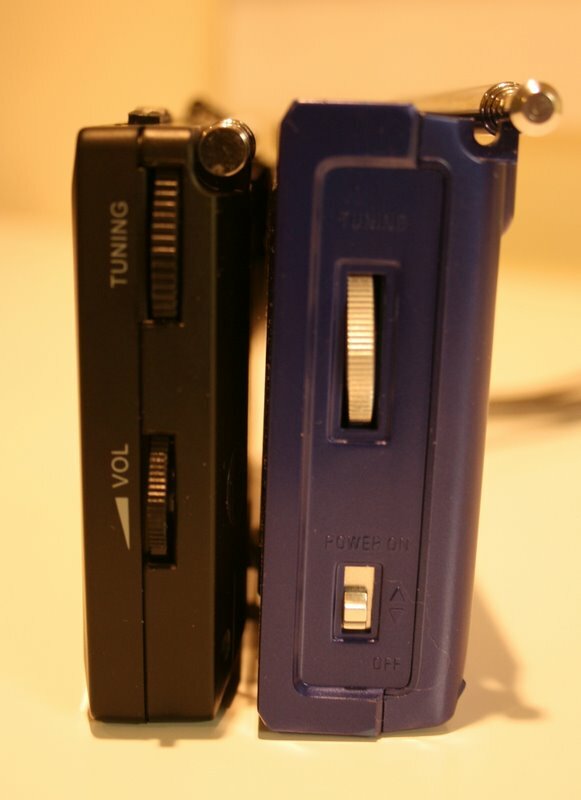 I was very intrigued by this radio since both it and the future Tecsun R-2010 are the newest of their kind. We’re still waiting for the R-2010 to hit the market, but the DE321 was introduced just a few weeks ago. So, keep in mind that the DE321 I describe is not technically analog, although the dial and face appear to be. 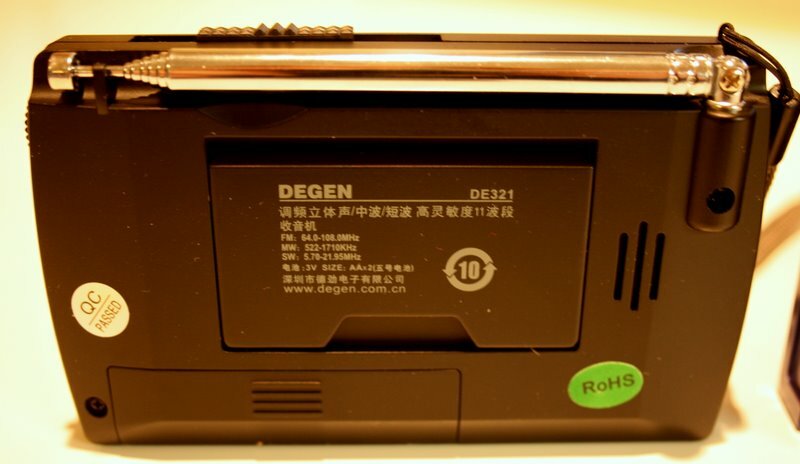 The Degen DE321 is slightly thinner than the Kaito WRX911. My first impressions of this radio are very positive. The DE321 is small, slim, and fits nicely in the hand. While holding it the first time, I even noticed a small indentation where my index finger fits on the back of the radio underneath the telescoping whip antenna. Nice touch! The DE321 also feels durable. It’s slightly thinner than the venerable WRX911–the radio I believe it best compares with in the analog world. It’s the first SW radio I’ve owned that can actually comfortably fit into the pocket of my jeans. Indeed, its size and form are fairly comparable to the typical smart phone. For a very tiny built-in speaker, the DE321 has unexpectedly decent audio. In fact, it is easily superior to the WRX911–its tones are more mellow and there’s even a hint of bass response. I’m sure the DSP chip has been tweaked to produce audio suitable for this application. The DE321 has a nice, sturdy back stand for tabletop listening. However, it takes quite a lot of pulling force to get it to pop out of its closed position; I keep fearing that I will break the stand when opening it up. For what it’s worth, I prefer this tension to radios that have floppy, lose back stands. The DE321 has a tiny red tuning light that works well when you receive a strong signal. For a guy who was raised on analog tuning, yet now almost exclusively uses digital portables, the DE321 is a strange animal. When I first started tuning the radio, I noticed that the tuning wheel feels slightly “sticky.” At first, I thought the stickiness of the analog encoder was causing the tuning to skip over stations, as the action was not as fluid as most analog-tuned radios. Upon further investigation, I realized that it’s not the slightly sticky tuning wheel producing the tuning “skips,” rather, it’s the fact that the tuning is actually digital, thus I was hearing the “steps” between frequencies, which tricked my brain, translating into the sensory experience of wheel stickiness. Still, since the tuning wheel isn’t terribly fluid, I am not discounting some real frequency skipping at times. I’m guessing that the steps are near 5 kHz on the shortwave bands, and that the single bandwidth is rather wide. The tuning steps on medium wave and FM seem to be appropriate for international use. On a side note, the tuning experience is exactly opposite to that of the Grundig S350DL–an analog-tuned radio with digital display. The S350DL’s tuning feels sloppy and flexible, and the receiver is prone to drifting. The DE321, on the other hand, has a vague analog tuning display, but with precise, incremented tuning behind the scenes. I’m pleased to note that the DE321’s stability is rock-solid and does not drift. For casual band scanning, I find that the bandwidth and tuning steps are well placed. Happily, there is no noticeable muting between tuning steps. The Degen DE321 with its older analog cousin the Kaito WRX911 in the background. On the shortwave bands, I feel that the sensitivity and selectivity are well-balanced. When I compare reception with the WRX911, the DE321 seems to pull in faint signals out of the murk a little better than the WRX911. However, I do notice some “pumping” as the AGC tries to cope with faint signals; it reminds me a bit of the Tecsun PL-310 in this respect. Sometimes I also notice that faint signals can range from being very faint to stepping up to clear and strong very quickly–the switch sounds like the DSP moving from not having enough signal to digest, to having enough to do its job. This can be a little frustrating as broadcasts may sound strong one minute, become weak within a fraction of a second, then pop back up again. I only observed this phenomena, however, when processing weak signals. Normal broadcast stations come in quite clearly. Though I chose not to spend much time evaluating FM and AM (please comment if you have done so), I found the FM and AM (MW) performance to be on par with other radios using the SiLabs DSP chipset. I may expand upon this in the review later. (Update 16 Mar 2012: With more time spent on AM (MW) I realize performance on this band is sub-par–see comments). In conclusion, I think the DE321 is a great buy. It’s certainly a steal at $21 US, shipped. Though I simply find the idea of a rather vague analog encoder and display combined with the precision of a digital tuner a tad quirky–even backward–at the end of the day, the audio is very pleasant and the form perfect for slipping into your pocket. This entry was posted in Radios, Reviews and tagged DE321 review, Degen DE321 review, KA321, Kaito, Kaito KA321, Kaito KA321 Review, Kaito WRX911, Radio Reviews, Shortwave Radio Reviews, WRX911 on November 12, 2011 by Thomas. Yesterday my 10 year old son and I went to Ap Liu Street – Hong Kong’s ‘electronic fish market’, roughly equivalent to Tokyo’s Akihabara – at least as I recall it from many, many years ago…. We went to visit Simon at CQ Shop – just a bout the last Ham radio supplier in Hong Kong…. so sad because just 20 years ago Ham radio supplies with highly competitive prices were everywhere…. now they’ve evaporated – a side effect of the internet I suspect…. Still CQ Shop at 1st Floor (2nd Floor if you’re from North America) 252, Ap Liu Street, Sham Shui Po…. easy to get to, just take Hong Kong’s superb underground railway / subway / metro to Sham Shui Po (on the ‘red’ line) and get out at Exit C…. 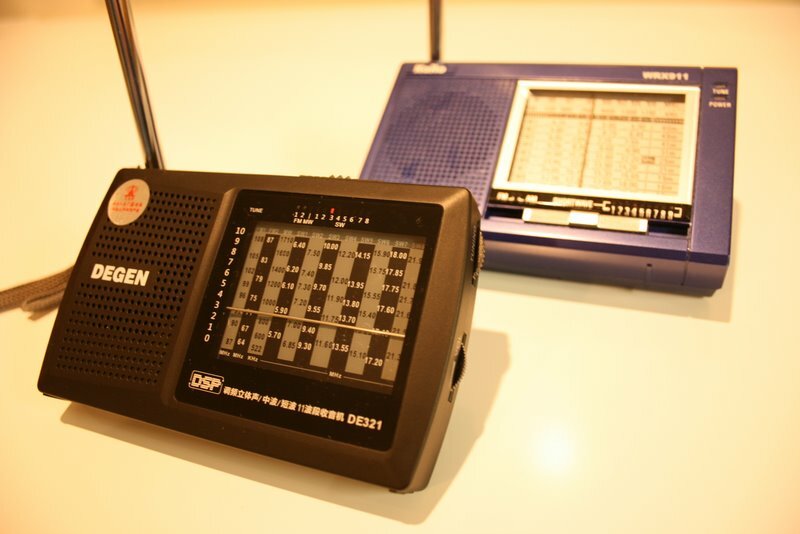 In one of the myriad of stores selling pocket TVs PLL AM /FM radios etc I saw a Degen DE321 short wave radio…. it’s so tiny at 12cm x 7cm x 2cm / 4.6″ x 2.75″ x 0.7″ (about the size of the palm of my hand – without the fingers)… this store was in a side street market running at 90degs to Ap Liu St. the asking price was HK$98.00 / US$12.56 / GBP10 / Euros 11.22…. Whenever I saw it on another stall I checked the price and the general price range seemed to be around HK$110 to HK$128 or US$14.10 to US$16.41, GBP11.02 to GBP12.82 or Euro12.60 to Euro14.66…. Looking at the size of the De321 it looked like a toy. Still I thought it would be fun to try it out if I could get it for less than the asking price – everything in streets like this is open to bargaining. I ended up buying it for HK$88 / GBP8.82 / US$11.28 / Euro10.08…. http://www.electronicspecialtyproducts.com/ – then I expect one could get quite remarkable results from this tiny radio…. I like sleep in almost dark in the night while listening to this Degen321, lay it under my pillow. It is hard to see the frequency dial, I made some modification, I move the LED tuning lamp to the dial’s left side and place there with hot glue. I choose 3mm Yellow LED so now I could barelly see the dial in the dark. After compare the Degen321 speaker sound to TECSUN PL310et, I found that TECSUN PL310et has more comfortable sound while Degen321 has more treble sound, I put 33 micro Farad electrolit capacitor across speaker terminal and make it sound better. The capacitor and speaker have their polarity ! hongkong but later i changed my decision. receivers and now i own PHILIPS DL167. usually i listen shortwave and fan of bbc Hindi , bbc world service , cri , voice of Asia , vividh bharti etc. now i decided to purchase kaito ka 321 , thanks and keep in touch. Acabo de recibir el radio DEGEN DE DSP 321 y estoy sorprendido con la selectividad y sensibilidad, el FM es sensacional de escuchan emisora de muy lejos, AM magnifico muy buena sensibilidad y el SW le doy una calificacion de 10 se escuchan las emisoras como Radio Habana Cuaba, RNE, NKH, KBS, RADIO IRAN, LA VOZ DE ESLOVAQUIA, CRI etc con la antena que el radio trae. I bought a Degen 321 yesterday. Inside my home, I usually get poor signals for even FM and AM (no need to say anything about SW). So I usually hear SW from outside. And strong stations of FM or AM inside the home. I also have a local FM radio of Philips and Tecsun R909. Tecun R909 picks up most of the FM, AM stations and many SW stations from inside the home itself. The problem is that with Degen 321, I get only the strongest of all the stations and that too, only in some places inside the home. It’s receptivity is very poor. Is that a defect or something or problem with poor signal inside? Also, I had removed the antenna and fixed it back. Can the problem be due to antenna not in place or something like that? In a place with low signal strength, what can I do to improve the receptivity? kaito ka 321…. call me if u want to sell urs..
costing almost same at Amazon. 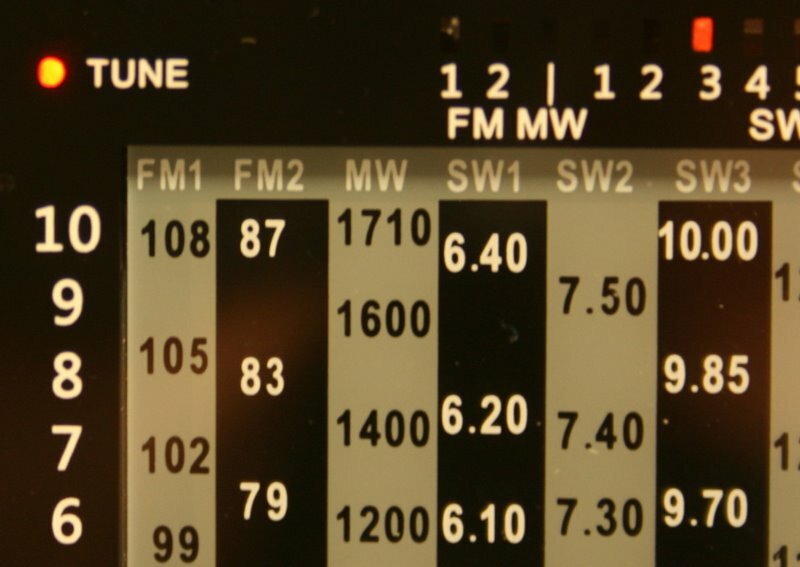 Question: Does “5kHz steps” on AM mean that European MW stations cannot be tuned in correctly? (US has 10KHz steps from station to station, Europe has 9kHz). Good question. Since this unit is really marketed to Asia, I would imagine that 9khz stepped would almost be the default. Problem is, I can’t find this spec for the DE1129. Sometimes, I feel like it may actually be designed only for 9kHz, but the bandwidth on MW is wide enough that it still receives stations in N America on 10kHz increments. I will play around a bit more on MW and see if I can draw some firm conclusions. SWLing Post reader, Dennis, spent time with the DE321 on AM (MW) and found reception very poor. He wrote the seller (and to their credit) they contacted Degen. Degen’s response: “the FM band and SW band are using the telescopic whip antenna to receive the signal, the MW band use the ferrite bar antenna, but because this radio is too small so the inside ferrite bar antenna is very small also, this cause the signal reception is not very good than some bigger radio, this is the root cause for your question, hope it is helpful for you.” On the positive side, you will be pleased with SW and FM reception on the DE321, just keep low expectations on AM (MW). You could probably take a long wire antenna, and wrap the end of it several times around your De321, preferably in the same circular motion as the coil is inside the radio. This would transfer the single very efficiently from the long wire to the ferrite bar antenna inside and boost your signal strenth greatly. Or you can take the end of the long wire, and loop it flat like a plate, and tape it together, and hold it up against the back of the radio flat as if it were a plate. I’ve used this method on a 1951 GE 430 AA5 AM radio with great success. Of course, I had 100 yards of long wire out laying on the ground 😉 The longer, the better.